This image shows the structure of NaH7. At center, in green, is the new three-atom hydrogen 'chain'; it is surrounded by several 'normal' two-atom molecules of hydrogen, also in green. Image: Duck Young Kim. Scientists have been investigating different ways to force hydrogen into a metallic state for decades. 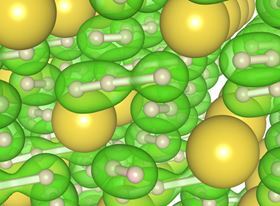 A metallic state of hydrogen is a holy grail for materials scientists because it should act as a superconductor, offering no resistance to the flow of electrons and thus increasing electricity transfer efficiency many times over. Now, for the first time, a team of researchers led by Viktor Struzhkin at the Carnegie Institution for Science has experimentally produced a new class of materials that blend hydrogen with sodium. These materials could alter the superconductivity landscape and also be used for hydrogen storage in fuel cells. The research is published in a paper in Nature Communications. Scientists had already predicted that certain hydrogen-rich compounds comprising multiple atoms of hydrogen with so-called alkali metals like lithium, potassium or sodium could possess unusual electronic structures. This, in turn, could lead to novel metallic, high-temperature superconductors. "The challenge is temperature," explained Struzhkin. "The only superconductors that have been produced can only exist at impractically cold temperatures. In recent years, there have been predictions of compounds with several atoms of hydrogen coupled with alkali metals that could exist at more practical temperatures. They are theorized to have unique properties useful to superconductivity." Now, the predictions have been confirmed. In addition to Struzhkin, the team included Carnegie researchers Duck Young Kim, Elissaios Stavrou, Takaki Muramatsu, Ho-Kwang Mao and Alexander Goncharov, together with researchers from other institutions. The team conducted various high-pressure/high-temperature experiments; under these extreme conditions, matter can morph into new structures with new properties. They squeezed samples of lithium and sodium in a diamond anvil cell to enormous pressures while heating the samples using a laser. At pressures of between 300,000 and 400,000 atmospheres (30–40 gigapascals) and temperatures of about 3100°F (2000K), they observed, for the first time, the synthesis of various ‘polyhydrides’ of sodium (Na) and hydrogen (H). These included NaH3 and NaH7 in very unusual configurations. In particular, three negatively-charged hydrogen atoms in the NaH7 material lined up to resemble one-dimensional hydrogen chains, which is a new phase that is very different from pure hydrogen. "This configuration was originally predicted to exist in 1972, more than 40 years ago," remarked Kim. "It turns out that our experiments are in complete agreement with the theory, which predicted the existence of NaH3. The bonus is that we also observed the compound with seven hydrogen atoms." The team used theory to guide their experiments and measured samples of the sodium polyhydrides using both a method that reveals atomic structure (X-ray diffraction) and a method that identifies molecules by characteristics such as their minute vibrations and rotations (Raman spectroscopy). Theoretically, the sodium polyhydrides should be stable under pressure, have metallic characteristics and unique structures, and show superconducting properties. "Further work needs to be done to see if materials in this class can be produced at lower temperatures and pressures," said Struzhkin. "But this new class of matter opens up a whole new world of possibilities." Researchers have modified two enzymes so that they self-assemble to form a stable catalytic biomaterial that can be used in industrial production.